With strong incentives to move away from traditional fossil fuels, European countries, particularly the United Kingdom, are using wood pellets to replace coal for electricity generation. In fact, in addition to buying pellets from existing mills in the U.S., many European utilities are building large pellet mills in the southern United States that will produce pellets solely for the export market. Exports aren’t just going to power plants, though. 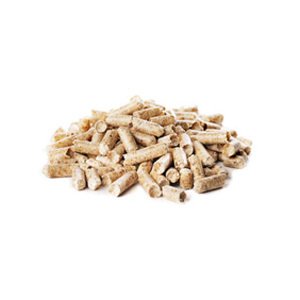 Italy continues to grow its residential wood pellet heating market. Because Italy produces just a small fraction of its pellet needs, the country’s imports have escalated from 500,000 tons in 2009 to over 2.5 million tons in 2013. 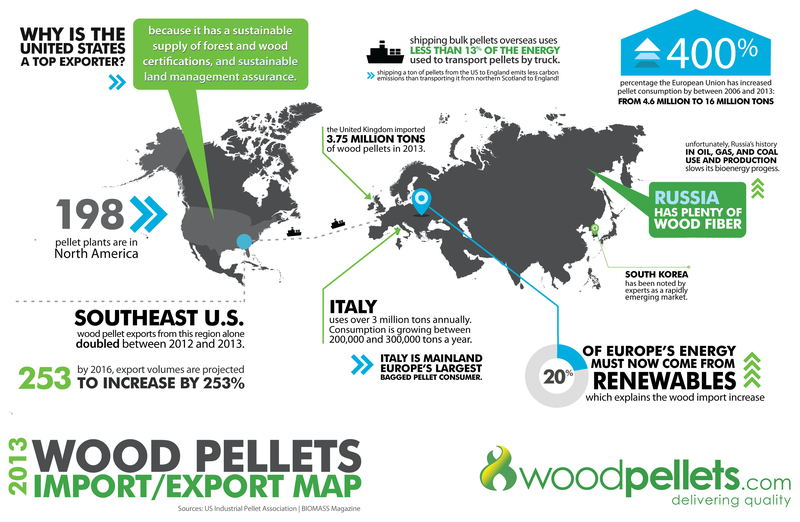 The majority of the pellets that Italy imports come from North American pellet producers. 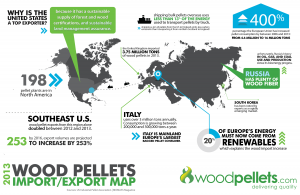 And with many Italian consumers moving away from traditional fossil heating fuels, the demand for wood pellets is expected to grow by 15% (again) this year. While all this interest in pellets as a clean, efficient fuel is a testament to how appealing they are, it does put more stress on the mills to produce enough pellets for everyone and continue to add new factories to keep up. After the harsh winter last year, many folks found themselves running out of pellets in February and March – causing a short term shortage of pellet fuel. Everyone in the industry, from the mills to the retailers to the people burning the fuel, ran through their entire inventory last spring. Many mills (and retailers and consumers) take the spring to stock up on pellets in anticipation of the fall sales of pellets. Since all the pellets produced last spring got sold in the spring, this meant that almost everyone was running behind in stocking up for this fall. Call this the hang-over effect from last winter. No one wants to be caught short of fuel in the middle of winter again this year, so people are buying early and stocking up now, increasing the demand for pellets this winter. Polar Vortex or Mild Winter? After a few years of mild winters, the winter of 2013 will go down as one of the coldest in many years. The question now turns to the future and to the winter of 2014. Will it be mild winter or a repeat of last year? That depends on who you ask. Sadly, the Farmer’s Almanac is predicting another harsh winter, both in terms of temperature and precipitation. Significant snowfalls and many winter storms are predicted across the northern zones. However, the Department of Energy is taking the opposite stance and predicting a mild winter. The EIA, using forecasts from the National Oceanic and Atmospheric Administration, predicts the number of heating degree days – a measure of heating demand – will fall 12 percent this year. As you can see, the forecasts are still all over the place, but after last year, we are seeing that people want to ensure they have enough fuel on hand going into this winter. What About The Retail Market? All these factors driving increased purchasing of pellets has definitely driven some changes in the pellet retail market – some of which you may have seen for yourself. One change is that with the growing demand for wood pellets, many pellet manufacturers have chosen to shrink the number of retailers they sell to and concentrate on supplying larger retailers. Thus, big box retailers are getting a larger proportion of the pellets this year – leaving many smaller retailers without any supply. Even with that increase, many big box stores are oversold and/or have long lead times for pellet availability. For stores that have traditionally focused on the customers who have traditionally just walked in to buy a stack of bags and take them home the same day, this is a huge change for them and their customers. Moreover, for those smaller pellet retailers that didn’t lock in their pellets orders early, many are just now learning that they will not be getting any additional pellets at all this year. What Does This Mean for the Pellet Stove Owner Looking for Pellets? As a result of all these changes to the market, many consumers have been caught off-guard this year. Consumers accustomed to buying from their local retailers, are surprised to learn that many are without pellets this year. Even for those retailers with pellets, this has led to some chaos and panic as the few retailers with steady supplies of pellets get inundated with orders and begin to see long delivery lead times as a result. We’ve seen some retailers institute minimum orders, others do maximum orders, and still others only accept orders from past customers. In our case, we have been able to consistently get pellets due to our long standing relationships with our pellet mills. However, we have had to push out our delivery timeframes in order to keep up with sales and make sure we can deliver by the time we say we will. Our advice? If you need pellets this winter, get your order in now. Obviously, we’d prefer you let us deliver your pellets. That said, no matter where you buy them, you shouldn’t wait to get your order in, since none of the factors above appear to be going away anytime soon. Previous article Happy Hearthoween Pumpkin Photo Contest!